A few pretty things I've been craving lately ;) It's been months since I first found this little guy and I think it might be time to buy it, right? I think it'll really complete my bedroom alongside this darling pillow and this cute print. Oh and what is that clunky looking Lilly Pulitzer thing in the corner? A wireless speaker in a gorgeous pink pattern. Literally the coolest thing ev-er! P.S. I've been obsessed with Sleepy Jones as of late. 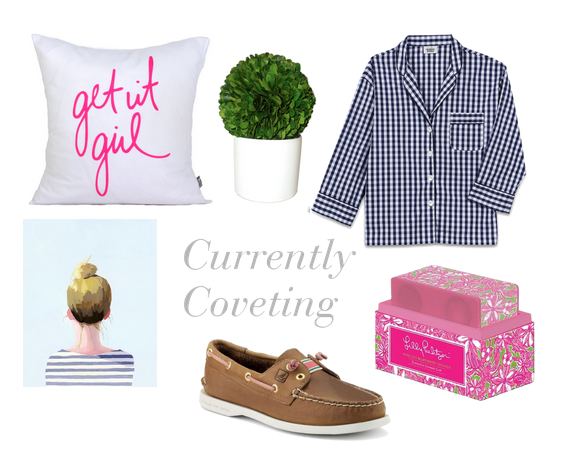 Perfectly preppy and comfy for sleeping. What items have been on your wish list lately? Awesome picks! I love those PJs! I love the pillow and the painting so much!!! What do you use to make these cute collage? Is it an app? i want gingham sleepy jones pajamas! or may just get the flannel jcrew factory ones. also, mackenzie is having a sale today so get the boxwood! I don't even think I could decide on one! I'm pretty sure you (we) need them all!